I never saw Ken Griffey Jr. as a young man. By the time I started watching baseball, Junior was over 30 and doing his best to stay healthy. I never saw him patrol center field with the grace and alacrity he was known for in Seattle, instead watching him plod around in Cincinnati before shifting to right. And I saw him play a full healthy season only once, in 2008, two months of which were spent in Chicago anyway. Despite all that, Junior is and forever will be my favorite player. The backwards cap, the sweet swing, the homers in bunches, but most of all the smile drew me to him. More than any other baseball player I watched growing up, you always knew when Junior was having fun. Two years after Jose Fernandez’s death, I can’t help but think of Junior and his smile. I wonder how many young fans like me were brought to the game because of it. How many other aspiring baseball players turned their caps around and swung for the fences, laughing all the way. And I wonder what we all we lost in losing Jose, how many in this young generation would be on the mound right now, smiling and reaching back for that extra gear, were Fernandez still here. His was not and is not the only beaming smile; we have Francisco Lindor, and Javier Baez. The list goes on. But the second anniversary of Fernandez’s passing made clear to me that the wattage has dimmed, even if only some. For years, there’s been a conversation in baseball circles as to whether advanced statistics are driving away the new generation of fans. This season in particular, some baseball writers (perhaps possessed of more gray hairs than my contemporaries and I are) have made the assertion that launch angle, exit velocity, and strikeouts have killed all the excitement in the sport. Seemingly every broadcast booth wants you to know that major leaguers are more concerned about drawing walks than hitting the ball, more concerned about launching home runs than poking one past the shift. It’s unfortunate that some of those with access to so much airtime seem to dislike the game they cover, or at least this iteration of it. I think of the baseball grumps, as Meg Rowley dubbed them, in tandem with Jose Fernandez because I think the grumps, amidst all their fretting, have forgotten something important: Baseball is, as much as it is about any one thing, about joy, plain and simple. There’s so much bad in the world, now and always, that I turn to baseball as an escape. Not as a denial, but as a reprieve. There’s bad in baseball too, don’t get me wrong. But in spite of all the bad that flourishes in baseball’s loosened seams, I still believe that the game — as an afternoon pastime, an event of utter non-importance — breeds joy. 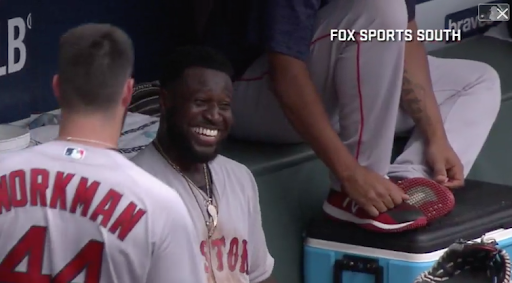 As we enter the final stage of the season when joy reaches its zenith before the long winter, I wanted to revisit some of the best moments of baseball joy from 2018. These moments remind me of Jose Fernandez, and of Ken Griffey Jr., and of the times when the world was right. When nothing else mattered for a few seconds but a ball and a bat on a diamond of dirt and grass. As far as I can tell, there are two types of joy in the world: Joy borne of extreme circumstance, and joy that comes from the natural, the everyday. I want to focus first on the second type. Jose Fernandez embodied natural joy, smiling as he caught a Troy Tulowitski liner up the middle or ribbing Evan Longoria for hitting too long a home run. Fernandez’s joy was infectious, leaving me smiling any time I watched him. He was having so much fun playing, why shouldn’t I have just as much fun watching? Shohei Ohtani is the current incarnation of everyday baseball joy. When he plays, a smile is never far from his face. 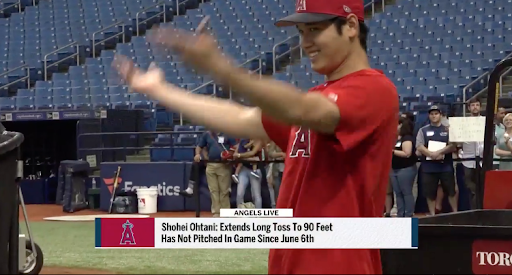 I don’t know if Shohei Ohtani is as happy as he seems or not, but more than any other current player, I feel happy watching him. It’s a sentiment that is shared by other people. At the end of May, Cut4 ranked Ohtani atop its list of the best smiles in baseball. In fact, I’m not sure I’ve ever seen the rookie without a smile. He even smiled while doing arm circles above a chyron proclaiming that he can’t do one of the two baseball things he does very well! The man will not stop smiling. But this is a list of moments, so I must distill the second-best two-way player in baseball history to one event. It came early in the season. Ohtani had already recorded his first career win as a pitcher and notched his first career hit. To continue the streak of firsts, in his third major league contest Ohtani launched a rather mundane home run to right center. The blast, off a looping, 74-mph Josh Tomlin curve, brought home three runs, but more importantly, it brought Shohei the silent treatment. He jogged into the dugout, smiling of course, and sauntered for a moment, seemingly confused that no one was congratulating him. Having gotten the joke, he began throwing around air high-fives, taking it all in stride. Wanting to celebrate with someone, anyone, Shohei started jumping on the back of a teammate, pestering for attention. It would be easy to describe him as a younger sibling, but he reminded me more of a person surprised by a friend at the airport, delighted by their friend’s prank but really just ready to tell their stories and laugh and bond all over again. He may have been in on the joke, but look at how Shohei wants it to be over, so he can laugh and jump and make his teammates happy with his happiness. Before the final pitch of Sean Manaea’s April 21 no-hitter, there was a shadow of doubt. Manaea had already walked his second batter of the game and had just fallen behind 2-0 to Hanley Ramirez on his 107th pitch of the night. The camera cuts to his pitching coach, scratching his head before looking vaguely concerned in the general vicinity of his knee. Those are the actions of a man who knows if Manaea walks Ramirez, he will likely have to go talk to Manaea and say something along the lines of, “Sean, this is your last batter. You either get him out and leave this stadium a hero or you let him reach base and never know what could have been. Winter is coming, Sean.” Something like that. No pitching coach wants to say that. The camera cuts back to Manaea. He’s staring intently. He seems tired. His eyes close, then flit around. For a split second he makes direct eye contact with the camera. The fourth wall has broken. You know now that there was never any doubt. The pitching coach would never have to leave his perch. The pitch was away, and Ramirez pulled a grounder right to Marcus Semien the shortstop. Before you see Sean Manaea, you see Jed Lowrie with arms raised above his head celebrating. And then, pure happiness. The joy borne of finality. The joy that comes when you thought it wouldn’t work but now it has, so all you can do is bounce up and down with a wide open mouth smile and make sure everyone else around you is having as a good a time as you are. Allow me to offer two thoughts on the experience of baseball for those who play it. First, professional baseball, more than any other sport, is a lonely life. For nine months of the year, you work, but your work involves constant travel. 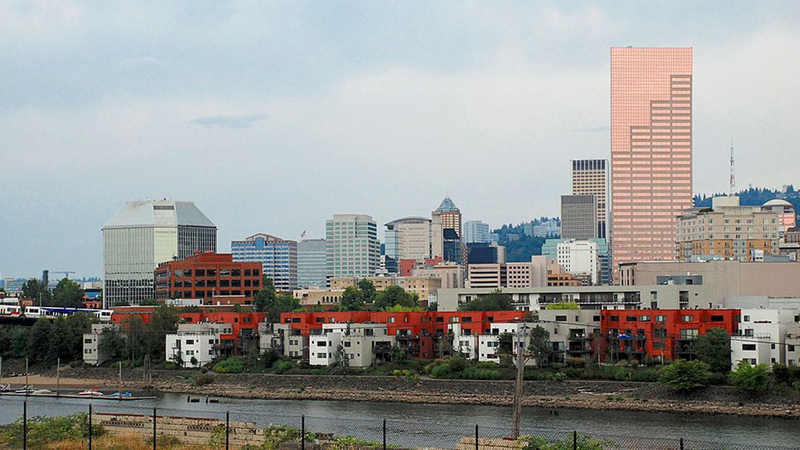 Ten-day home stands break up the city-hopping, but even those home stands aren’t necessarily where a player’s actual home may be. You have your teammates, but sometimes you may prefer other friends. Less-athletic friends perhaps. Or maybe similarly athletic friends, but who have a different life experience. The same old thing can become tiring. Second, I imagine there is no greater annoyance as a professional baseball player than getting hit by a pitch in an exhibition game. The ball was still thrown just as hard, but your pain means nothing to anyone but yourself and the people who write your checks. Sometimes the loneliness of baseball and the pain of a meaningless HBP converge. Specifically, they converged on Eugenio Suarez in the bottom of the seventh of this year’s All-Star Game. He took a pitch off his leg, then advanced to second on a wild pitch at which point, Francisco Lindor, perhaps appreciating the indignity Suarez had just suffered, decided to kiss it and make it better. Suarez, because he is a major league baseball player who is supposed to be impervious to pain, started batting Lindor’s hand away. But I expect there was a bit of gratitude there, too. We can’t see Suarez’s face, but I assume he’s smiling. 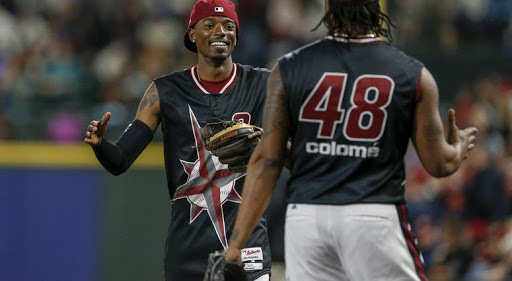 We can see Lindor, who is possessed of an open-mouth, belly-laugh grin spread wide across his face. Lindor’s gesture shows the joy of camaraderie among similarly-situated travelers, bonded by the shared weirdness of their profession that outsiders will probably never understand. They’re playing a game, yes, but it’s still a job with its own annoyances that can build into lasting grievances. Lindor’s kiss is a little reminder that it is a game and it can be fun, even with those annoyances. Their smiles then are the joy in the little things and the less lonely moments. For the longest time, my favorite player to watch was Brandon Phillips, largely because of his smile and seemingly carefree personality. It helped of course that he had a penchant for the extreme, turning sure hits into outs and making sure outs into acts of wonderment. This season, it seemed that baseball was done with Brandon Phillips. He had no team and was past his peak and frankly there were younger, cheaper, better players available. There would be fewer daily smiles in major league baseball, but we woulod always have the YouTube videos. But then, some mighty being decided that Red Sox second basemen were cursed to be injured. Both Dustin Pedroia and his acquired replacement Ian Kinsler went down. And there was Brandon Phillips in Pawtucket, the break-in-case-of-emergency second baseman the Red Sox hoped never to use. It was September 5, the first time Phillips had played in the bigs since the 2017 season ended 340 days prior. The Red Sox were playing the Braves, Phillips’ hometown team, in Suntrust Park and trailed by one with two outs in the ninth and a man on first. Phillips, who improbably already had two hits on the day, strolled to the plate. The pitch was low and in, but Phillips got full extension and launched the ball far past the left field fence. His momentum pushed his body weight onto his back heel and he leaned like a wedding guest doing the limbo as he watched the ball sail. But when he dropped the bat and began his trot, there was no smile. No noticeable joy for his demonstrative return. Just a regular, home run jog. Maybe he was relieved. Or perhaps his stoney face denoted the chip he still felt on his shoulder at teams having thought he was washed up and unworthy of a big league contract. Either way, it all melted away when he got to his teammates, the smile cracking the previous stoicism, the excitement creeping into his step as he starts skipping toward the high-fives. And then finally, when he sits: The relieved joy of unexpectedly defying age for one more afternoon. Down three, two outs, bases loaded — if you hit a walk-off grand slam, would you not airplane around the bases? If you say you wouldn’t, you’re a liar. David Bote’s home run, his trot, is childhood joy, the best kind of joy. The joy of growing up being exactly how you imagined it for a second. You are both invincible and so very human. You are Superman and your only kryptonite is tomorrow, so you try your best to never let it come. I started with Ken Griffey Jr. and Jose Fernandez, so I might as well end with them too. 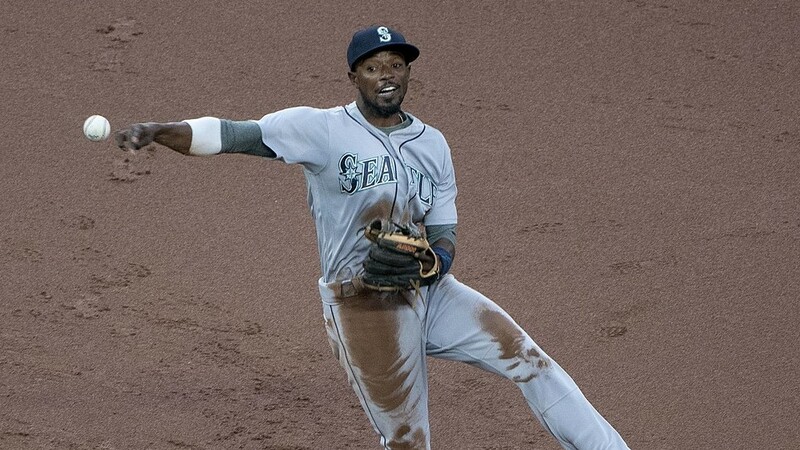 Dee Gordon, Marlins teammate of Fernandez and current Mariners center fielder, is another fount of natural joy. Just look at his face after he robs Mike Trout of a sure home run. He sticks his tongue out, bemused at he’s done but also unintentionally taunting the greatest baseball player of this generation. 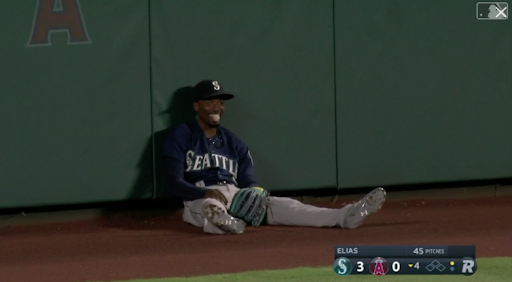 You always know when Dee Gordon is having fun on the field. In the first game after Jose Fernandez died, the Marlins all wore No. 16 with Fernandez written across the back. Gordon, the Marlins’ leadoff hitter, stepped into the right-handed batter’s box to honor Fernandez. He took a pitch from Bartolo Colon. He then switched to his natural left-handed side, and on the next pitch, the very next pitch, hit his only home run of the season. It was only the ninth home run of his career. He cried as he rounded the bases and walked back into the dugout, head bowed. He sobbed as he hugged teammates before disappearing into the clubhouse. It was a cathartic joy, one of grief and remembrance where all of the emotions well up and spill out in full view of the world. Earlier this year, on April’s Fools Day of all days, Gordon hit another home run. It was his first of the season, and this time he did not sob as trotted around the bases. Instead, he invoked Junior. The no-doubt swing and the top-of-the-world strut. It was all classic Griffey. Three months later, he impersonated Griffey again, wearing a sleeveless jersey and backwards hat on Turn Ahead the Clock night. And this time, he nailed the smile. Phillips is a native of Atlanta. Redan High School. And, of course, played for the Braves. This is delightful and good. Feel like Javier Baez and Nolan Arenado’s hug in the basepaths belongs in here somewhere. Even if Baez was using it strategically, it seemed like they both got a good and joyous chuckle out of it. Fun article, needs more Beltre. We all need more Beltre. I’d probably say Bryce Harper in the HR Derby. That atmosphere was incredible. where’s ji man’s walk off?